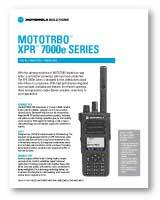 The Motorola XPR 7550e is the flagship radio offering all of the advanced features and power of the entire MotoTrbo radio family. The XPR7550e is a digital radio that delivers mission-critical voice and data communications. Using Bluetooth® and integrated Wi-Fi, you are able to talk wirelessly, perform remote software upgrades, and track indoor and outdoor locations; and with both trunking support and legacy analog technology, your organization can keep connected while it grows. The XPR 7000e Series features powerful audio amplifiers and industrial noise cancellation, for loud and clear delivery. With the latest energy technology, these radios can deliver up to 29 hours of battery life and with improved receivers, boosts range up to 8%. This radio has a prominent orange emergency button, that can summon help with just one touch using Transmit Interrupt to clear a channel if necessary. The XPR 7550e also features integrated accelerometers that sense if you have fallen and can call for assistance automatically. 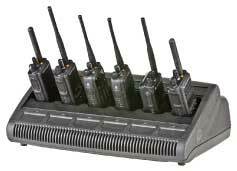 Plus with an IP68 waterproof rating and testing to tough military standards, you can know these radios are dependable. 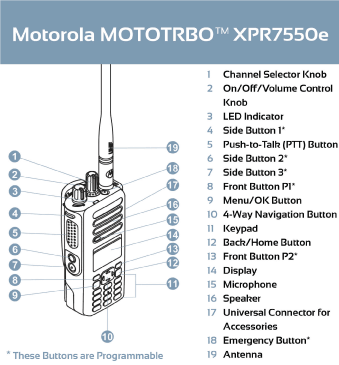 The Motorola XPR 7550e is loaded with features; including, Location Tracking, to monitor the whereabouts of mobile workers so they can respond immediately in an emergency, Integrated Bluetooth, for audio and sharing of data wirelessly and instantly between devices, Text Messaging, for quick and discreet communication when voice isn't feasible, Telephony gives you the ability to communicate between radios and landline or mobile phones, Work Order Ticket Management lets you issue tasks to your team members to save time and increases productivity, and Man Down Applications so your radios can call for help when your workers can't. With a 1000 channel capacity for customizing your talk groups and a colored display for quick radio status updates, the XPR7550e will help organize your radio fleet like never before. Amerizon is partnered with Teldio, a two-way radio applications provider delivering solutions targeted at improving worker efficiency, employee safety & cost reduction for enterprise customers. TRBOnet is a professional grade application especially developed for Dispatch centers that monitor large amounts of traffic. TRBOnet was built from the ground up specifically for this radio system and is constantly expanding to add new features every day. Our partnership with Seqent allows us to provide manufacturers with real time alerts sent to video displays and via the MotoTrbo two way radio system. 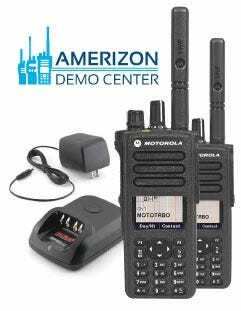 You should always know what is happening in your production facility and we help you by keeping you informed and mobile with a rugged solution from Motorola. WAVE provides an excellent solution to unify all your different devices onto one network. By using Wave, you can easily connect your smartphones, radios, computers and landlines to communicate freely and get better real-time coordination and response. With IMPRES, we can provide you with accurate battery-critical data for each battery in your fleet. IMPRES software automatically collects data while batteries are in use in the field or in the charger so you know for sure whether your battery is mission-ready. This behind-the neck wireless headset unleashes the power of your radio to shield you from harmful, high-decibel noise while letting you hear the surrounding sounds you need to—people, alarms, alerts, and more. This versitle charger gives you the ability to charge 6 Motorola XPR 7550e radios at once. Helping you build the charging station you need to keep your radio fleet organized. If you are looking for more information on two-way radio capabilities, management, and optimization, click any of the links below, and be sure to visit our Blog for additional articles. Two-Way Radio or Cell Phone: What's Best for your Business?